The trial of the Pirate Bay operators in Sweden has generated huge amounts of media coverage. But one of the most interesting things about Pirate Bay hasn't got a mention. In his daily dispatches for WiReD, court correspondent Oscar Schwartz swoons over the boyish charm of "likeable" and "winning" Pirate Bay PR guy Peter Sunde. But there seems to be something about Pirate Bay that no one wants you to read: its debt to one of the most notorious fascists in Europe. Reg readers will already know a little about Carl Lundström's background. But as Andrew Brown, author of the autobiographical Fishing in Utopia, points out, no English language coverage of the trial has mentioned this. Thanks to Brown's blog, we know a little more about Lundström. For example, Lundström was linked to a gang of skinheads that attacked Latin American tourists in Stockholm in the mid-1980s. [Expo.se report (Swe) - 2005]. Over the years, Lundström has switched his support from Keep Sweden Swedish to the far-right headbangers party New Democracy - but was thrown out for being too right wing. He's currently bankrolling 100 candidates for the Swedish equivalent of the BNP. Lundström is alleged to own 40 per cent of The Pirate Bay - the largest share - and gave it servers and bandwidth to get going. As one of the four defendants, been a regular attendee in court. But the presence of this significant national political player hasn't been worthy of a WiReD mention since the trial kicked off. Or a mention anywhere else. Why would that be? For me, there are two interesting aspects to this peculiar, and very selective silence. One is that anti-copyright activists like to think of themselves as thoroughly decent, forward-thinking progressive people - because the internet is a new democracy, they're reflecting a fairer world. They like to contrast the hygenic efficiency of the technology with the old (and implicitly corrupt) copyright businesses. It's almost a badge of moral superiority. But like the Futurists a hundred years ago - the original Freetards - they don't mind jumping into bed with neo-Nazis when it suits them. In this case, that's so long as the free music and movies keep flowing. The second is WiReD's choice of Oscar Schwartz to file courtroom dispatches from the Pirate Bay trial. He's the only English language courtroom reporter, and bloggers and professional publications take their cue from his reports. But Schwartz describes himself as "a leading critic of intellectual property" and an activist. His reports duly fulfil the caricature of plucky freedom fighters and bungling prosecutors that fellow activists (and some journalists) want to read. "The fact it is represented by four young, rebellious and innovative guys all adds to the image of the rock'n'rollers facing up to the The Man," drooled Guardian blogger Jemima Kiss, who omits to mention the Fourth Man isn't particularly young - or looks great in jackboots. 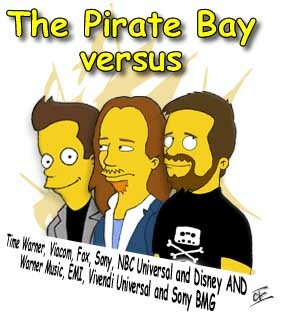 "Whatever happens at the end of this case, Pirate Bay wins."